The woes of residents of Madina, Patang and surrounding areas will soon be over. It follows the commencement of works on the construction of footbridges on that stretch of the Accra-Patang highway. The 5.6 kilometres stretch road has claimed a number of lives due to the incompletion of footbridges on the road after 9 years when the road was officially opened, resulting in recent agitations which compelled authorities to move the contractor ‘Justmoh Construction’ to site with an executive intervention. 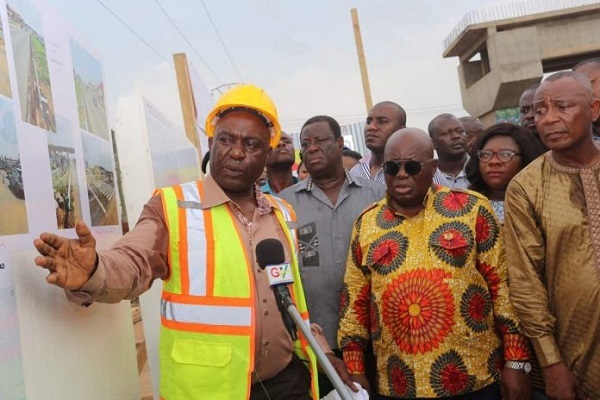 Justice Amoh of Justmoh Construction and Kwasi Nuamah at the Department of Urban Roads conducted the President around one of the construction sites. This was the second day of his three-day working tour of the Greater Accra region. In all, six footbridges are being constructed at an estimated cost of GH¢5million. They are expected to be completed within 6-8months. The corridor forms one of the primary North-South arterial roads connecting the central business district of Accra, with an average daily traffic in excess of 30,000 vehicles. It further serves some of the main North-Eastern suburb of the Accra Metropolis, notably Legon, Madina, Adenta and Patang. Residents who had gathered on location could not but thanked the President and his government for the intervention; no matter how late it may have come. That, they said was because it would save further accident and deaths on that major road.